In some parts of the world, summer vacation is drawing to a close. In others, there are still several weeks left of rest and relaxation to enjoy. Whether you’re in mid-Summer or Summer’s End, there’s still great fun to be had as a family. I love this idea of unplugging and getting away for a day. Perhaps you’re going to spend a day hiking or an afternoon splashing at the lake. Whatever you do, make it a point to turn off the phone, sign off, and have real facetime with your family. Unplugged Sunday can provide you with all you need to know to get off the grid. Make a (practically) free sand and water table. Unless you find a good deal on a used activity station, these toddler tables can be expensive. Instead, pull out some short tables and make your own. We’ve used under-the-bed boxes to fill with water or sand. Add bath or beach toys and your kids have hours of fun waiting for them. Set up a DIY smoothie station. Smoothies are the modern mom’s healthy version of milkshakes. Funny how substituting yogurt for ice cream transforms it into a wonderful snack. Set out crushed ice, yogurt, juice, milk, and a variety of fruits so kids can combine their own combinations. If you have a Magic Bullet, so much the better. (Jen has great ideas for that here.) You can use party cups so that no one has to wait for the blender. Find a good book and pull up some shade. There are so many wonderful family read alouds to experience with your kids. And with widespread library locations and free Kindle downloads, you’re sure to find a good one without spending a dime. Find a cool place to hang out together and read aloud. You’ll be amazed at the shared adventure. 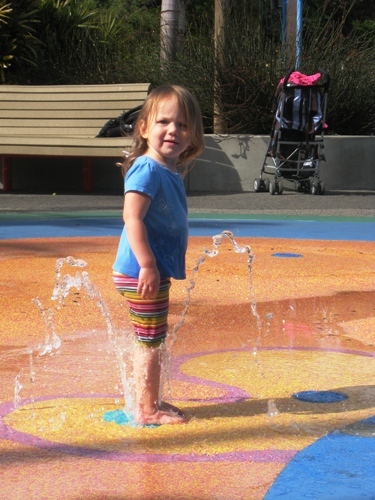 Find out which of your local parks offer a splash pad. Don your suits and grab your towels for some wet and wild fun. You are never too big to play with your kids. And experience tells me that the other kids at the park will flock to your side. Children crave that adult interaction — and you’ll be making sweet memories in the process. What do you do for a little summer fun with your family? — Jessica Fisher is a busy mom of six kids, making her home in San Diego. She shares delicious ways to act your wage at Good Cheap Eats and posts a variety of parenting and homemaking hacks at LifeasMOM. She is also the author of Summer Survival Guide, a complete planning workbook for the best summer ever. We “unplug” in the evenings and go outside. I bought bug houses from the Dollar Tree store and the kids have been catching lightening bugs. The Slip & Slide has been getting a workout during the day. We bought a membership to a local zoo and are using it. We can take off and explore to our hearts content and take advantage of the benefits of zoo membership. going for hike is always nice.. free and good for your body! I simply called a few local parks to inquire about free or near free days. I found out that we had several parks with free cookout/grilling areas, splash pads and trails. We also found out that a few gardens had yearly-monthly free days for residents of the county. In addition, we utilize local beaches and lakes. One of the things my husband and I also did was move into a house that offered more for our family. Our back yard is on a little pond with fish and ducks, we pay $1 for “duck” food or bait and we have hours of fun. Our neighborhood offers a pool as well as a play area and there are lots of areas safe for walking/biking. We also moved 2 doors down from my husband’s brother, our sister-in-law and niece… this makes for fun cookouts, double date nights and easy and free childcare for the adults. Slip n’ Slides and pools purchased in the off-season or at yard sales combined with a sprinkler or two are always fun. And, we save $$$ from our tax refund each year to buy “splash passes” to 3 local waterparks. They cost $280.00 for our family of 4, but they are well worth it. We utilize free movies at our local air force base (Grandpa is retired air force) as well as the free or $1 movies at cinemas for the Summer Clubhouses. Add to that the local libraries and bookstores and we have a summer FULL of fun for very little money! What a fun post! Thank you!